The Spazji Teatrali Theatres Catalogue is a collection of performance spaces in Malta and Gozo listing and describing the physical characteristics and technical equipment of many venues. Ninety per cent of theatre spaces are located outside Valletta, according to the first ever audit of theatre spaces in Malta and Gozo, which was officially launched earlier today. Only 37 per cent of theatres in Malta and Gozo are public; the majority – 45 per cent – belong to the Church, while 18 per cent are privately owned. 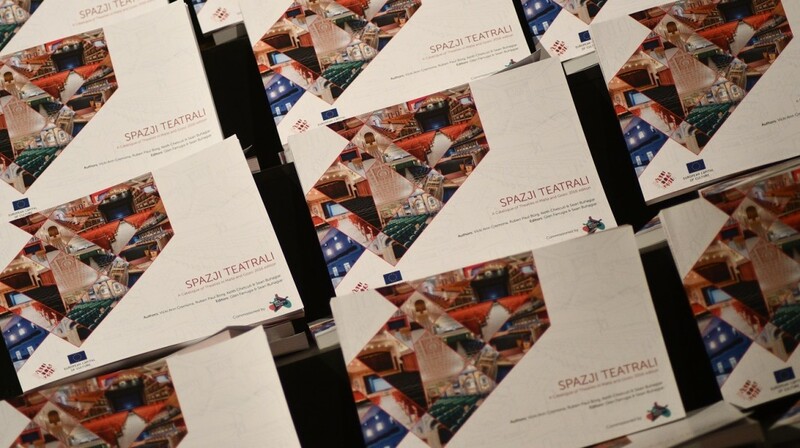 These are some of the key findings published in Spazji Teatrali, A Catalogue of Theatres in Malta and Gozo, a catalogue of 78 theatre spaces, which was commissioned by Arts Council Malta and implemented by the Valletta 2018 Foundation. The book was co-authored by Prof Vicki Ann Cremona, Dr. Spec. Ruben Paul Borg, Ing Keith Chetcuti and Sean Buhagiar. The catalogue lists and describes the physical characteristics and technical equipment of many venues across the Maltese islands that can be used to host theatrical or musical productions. The result is a wide-ranging and comprehensive profile for most venues, running the gamut from well-known spaces to hidden gems. This study aims to provide the culture sector with valuable informational resources about the spaces available within each locality, as well as the use of these same spaces in contemporary cultural activity. The launch of the catalogue is being followed by Tour Teatru Tazza Te, a series of tours organised by Teatru Malta, the newly-founded national theatre company, and Arts Council Malta and supported by the Valletta 2018 Foundation. The tours will run between April and July 2017. These tours, which will further showcase and explore some of the lesser-known theatres included in the audit, are expected to be of interest to theatre producers and directors who will also have the opportunity to talk about theatre with Teatru Malta representatives. Those registering for the whole tour are being offered free transport. The catalogue is a result of the Theatres Audit project, which is one of the three core components of the Valletta 2018 Foundation Cultural Mapping Programme. The project, commissioned by Arts Council Malta, forms part of the Council’s research and community strategic actions as outlined in its Create 2020 strategy. “By showcasing a number of community theatres which form part of Malta’s vast theatre ecology, we invite the theatre owners as well as creative practitioners to start a conversation which can help the creative sector to professionalise and grow further,” added Arts Council Malta chair Albert Marshall. The launch of the catalogue was followed by a preview of Teatru Malta’s new brand which can be seen on www.teatrumalta.org.mt. The catalogue launch and event form part of Viva t-Teatru, a series of events celebrating World Theatre Day, organised by Teatru Malta and Arts Council Malta. As part of this programme, a two-day informal forum on current issues in Maltese theatre, entitled Taħdita Teatru, is being organised on 25 and 26 March as a platform for debate on the remit of Teatru Malta. Also part of the programme is Manoel, Iftaħli, a series of free one-hour tours of Teatru Manoel on 26 and 27 March. These tours are being organised in collaboration with Teatru Manoel.